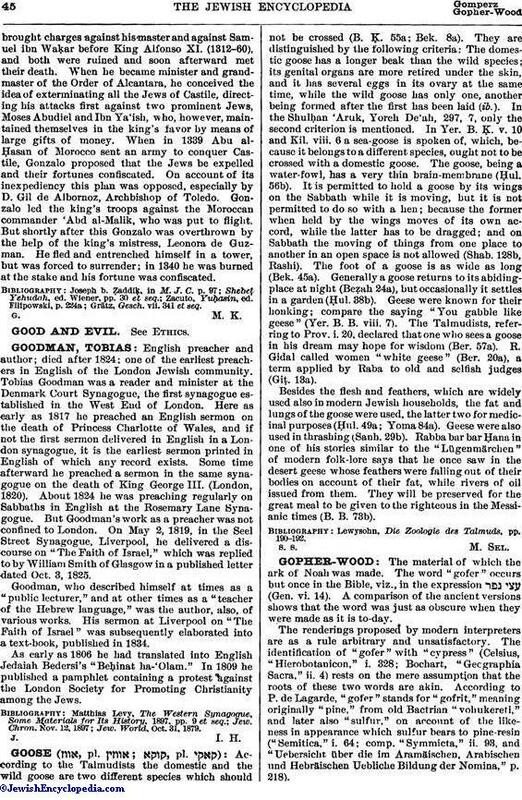 English preacher and author; died after 1824; one of the earliest preachers in English of the London Jewish community Tobias Goodman was a reader and minister at the Denmark Court Synagogue, the first synagogue established in the West End of London. Here as early as 1817 he preached an English sermon on the death of Princess Charlotte of Wales, and if not the first sermon delivered in English in a London synagogue, it is the earliest sermon printed in English of which any record exists. Some time afterward he preached a sermon in the same synagogue on the death of King George III. (London, 1820). About 1824 he was preaching regularly on Sabbaths in English at the Rosemary Lane Synagogue. But Goodman's work as a preacher was not confined to London. On May 2, 1819, in the Seel Street Synagogue, Liverpool, he delivered a discourse on "The Faith of Israel," which was replied to by William Smith of Glasgow in a published letter dated Oct. 3, 1825. Goodman, who described himself at times as a "public lecturer," and at other times as a "teacher of the Hebrew language," was the author, also, of various works. His sermon at Liverpool on "The Faith of Israel" was subsequently elaborated into a text-book, published in 1834. As early as 1806 he had translated into English Jedaiah Bedersi's "Beḥinat ha-'Olam." In 1809 he published a pamphlet containing a protest against the London Society for Promoting Christianity among the Jews. Jew. World, Oct. 31, 1879.